Electroforming allows us to produce uniquely designed hollow pieces of jewelry that are impossible to create by casting or stamping. It is a time consuming and expensive process that makes the jewelry pieces seamless and light weight/ Prince Charles of Great Britain, was crowned with an electroformed crown. In order to avoid confusion with electroplating let’s take a closer look at electroforming technology. Electroforming permits the creation of light weight jewelry designs with flowing undercuts and shapes impossible to achieve with stamping. When laymen talk about electroforming, they like to use the analogy of an M & M candy: if you sucked out the chocolate so that all you were left with was the shell, and that shell were gold, you’d have an electroform. Imagine if you took a typical three-dimensional piece of costume jewelry, gave it a dense electroplate finish, and then were somehow able to remove the base-metal core. You’d have an electroform, a hollow but sturdy piece of gold in the shape of the original core. This is precisely what electroforming technology allows you to do. This process has been around since the 1840’s, When the gold deposition is completed, the core is removed using a process called “evacuation.” After the core is evacuated, the copper coating is removed by using an acid bath, which etches off the copper without affecting the gold. The empty shell is then heat-treated to relieve stress. You are left with a hollow gold electroform to which you can affix the necessary findings to transform it mto a charm, earring, bracelet or any other piece. In the “cold bath” electroforming system that uses a wax mandrill, copper barrier plating is not necessary since the wax will not attack the gold. These wax mandrill are made in the same manner as waxes for investment casting In order to make the wax conductive so that the gold will adhere to it, a conductive paint is applied to the mandrill. Electroforming is not a mass production technique. The idea is to create designs that flow and cannot be easily stamped or cast. For a piece of jewelry to be labled electroform, you must remove the core or you won’t be able to market it as karot gold jewelry or sterling silver jewelry. Instead what you will essentially have is a piece of costume jewelry with an incredibly thick and expensive gold electroplated finish. The electroforming process can also be applied onto real leaves, sealife and gems and minerals. But in these cases, the base material is not removed. Real Leaves Preserved in 24Kt Gold – 24kt Gold Electroform Jewelry The beauty of this process is that each piece of jewelry is made from a real leaf so each one is unique. No two are alike. The process is called Electroforming. We take a hand picked real leaf and hand paint the surface with a copper based paint. Once the natural surface is coated with the copper metal we are able to dip the leaves into a solution of 24kt gold or other specialized metal finishes such as Silver, Pink Copper, Iridescent Copper, Black, Cobalt Blue on Black, Rainbow Iridescent Copper, Antique Copper, Antique Silver, Antique Brass, Antique Gold and Green Copper Patina. 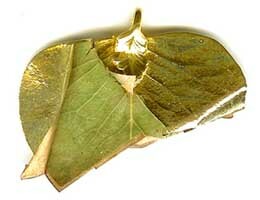 The result is a beautiful leaf that is preserved in pure 24kt gold or other finishes. Each leaf is a unique handcrafted piece of wearable art. Please see the picture which shows the Electroforming process. Note how a real green leaf is under the gold. In addition to leaves we also have beautiful roses, orchids. sealife and gems and minerals that are electroformed. Our Gold Overlay jewelry is produced by applying an average of 20 to 30 mils of 24kt gold onto the surface of our high quality brass based chain, charms and components utilizing an advanced acid gold Electro-Depositing process. Unlike basic decorative (cyanide) gold electroplated costume jewelry, Gold Overlay jewelry may be worn all the time. It has on average 5-7 times the thickness of most costume jewelry. Acid gold is a harder gold plating formula that was pioneered by the electronics industry which produces a durable finish. Unlike basic decorative gold electroplated jewelry, jewelry that is finished with an acid gold application has excellent long term wearing qualities. Our Gold Overlay jewelry is manufactured to produce in our opinion the finest alternative to solid 14kt jewelry. For our industry, 1 microinch is commonly referred to as 1 mil. Most electroplated costume jewelry ranges from 4 mils to 10 mils. The legal definition of electroplate is a minimum thickness of 7 mils of 10kt Gold. Plating thicknesses for precious metal objects and related trade is regulated by specific rules that are administered by the U.S. Federal Trade Commission. This can be found in the Code of Federal Regulations, Title 16, Commercial practices Part 23 January 1999. Precious metals under F.T.C. regulations include gold, silver, and the platinum metals group. F.T.C. requirements for plating thickness are expressed in both microinches (Referred to as a Mil in Costume Jewelry Industry) and microns. Gold filled chains generally have a thin layer of gold (usually 5% by weight) bonded onto the outside of a brass based core using heat and pressure. These chains wear very well, but do not have the look and feel of 14kt gold chains since they cannot be diamond cut or cast like 14kt gold jewelry. Diamond cutting would remove part of the 14kt gold that is bonded onto the brass based alloy. Gold Filled cannot be cast as the melting of the gold filled material would mix the outside layer of gold with the alloy that it is bonded onto resulting in a very low gold content casting. Gold filled wire and findings are very durable. Most decorative gold electroplated chains have a finish (application of gold) that is on average 7-10 mils or less in thickness. This type of finish is referred to as gold plated jewelry and normally has a reputation of not lasting long. Manufacturers of these types of chains often rely on putting a coating onto their chains to extend the wearing life of the product. People who are allergic to nickel are not able to wear these chains without a coating. When the coating wears off, the chain has limited wearing qualities. A product that is made from a base of sterling silver that is coated or plated on its surfaces with gold of at least 10K finess and at least 100 mils (2.5 microns thick – 100/1,000,000 inch). Most jewelry that is labeled Vermeil is actually in fact sterling silver that is only electroplated. Remember: The Sweet Taste of Low Price is Long Forgotten after the Bitter Taste of Poor Quality! If you want the best looking jewelry alternative to 14kt gold on the market, then you want our Gold Overlay jewelry. To get the look and feel of gold, you need to have a chain that is manufactured on the same equipment as 14kt/18kt gold chains are manufactured on. The metal that is best for this is brass. Not all brass chains are manufactured to the same quality as gold. The ones we use have similar characteristics to gold and silver. The result is that the look of the chain is identical to a gold chain in design and feel. We have found over many years of experience that people who have problems wearing electroplated jewelry can usually wear 40 mil gold overlay jewelry. It is rare that anyone who wears a 40 mil chain has the resulting skin irritations that one is allergic encounters with basic costume jewelry. This jewelry can be worn 24 hours a day, in the shower and while swimming, just like your fine 14kt jewelry. Our philosophy of doing business is based on long-term relationships. We believe a strong and healthy business relationship is far more valuable than a one-time sale. Repeat business is the only business that we care to pursue. We would like to develop such a relationship with your company. An analogy for electroplated chains could be flat paint. Good for a season but not that durable. An analogy for gold filled chains could be a cherry wood veneer applied onto an oak table. The veneer representing the 14 kt gold and the oak wood representing the brass based alloy. Rhodium is in the Platinum family. It is the most expensive and one of the hardest of the precious metals. It is Hypo-Allergenic and does not change color like Sterling Silver Jewelry. It is often used to produce white gold tips on gold rings. Some volcanic lavas (e.g. basalts), have round or almond-shaped gas holes (called amygdales), partially or completely filled with calcite, chalcedony, agate (banded chalcedony), crystallised colourless or amethyst quartz or other minerals. Ground waters carrying dissolved silica may seep into the lava while it is cooling, depositing silica minerals in the cavities. The agate and chalcedony were initially in a jelly-like state but hardened as they dried out. They may also form in pre-existing concretions or in spaces left by expansion of the rock under internal fluid pressure. They often have an outer shell of chalcedony, a crystal lining of quartz, carbonates or other minerals, and can be over a metre in diameter. Internal gas pressure forces the spherulite apart to form a central hollow, later filled with more minerals. Adjacent wedge-shaped segments of the cracked and expanding spherule move outwards and away from each other, helping form the typical star-shaped interior. Silica gels and clays filling the cavity can later dry out, shrink and crack, producing more internal structures such as interesting patterns of mineral-filled cracks. Later, silica-rich solutions may enter the cavity and fill it with banded agate, chalcedony, clear quartz crystals or amethyst. Solutions of different composition seep in at various times, leaving behind several layers of different minerals. Onyx is a cryptocrystallne (crystals are so fine color looks solid) form of quartz. The colors of its bands range from white to almost every color (save some shades, such as purple or blue.) Commonly, specimens of onyx available contain bands of colors of white, tan, and brown. Pure black Onyx is common, and perhaps the most famous variety, but not as common as Onyx with banded colors. Pyrite Suns, as the miners call them are found in coal mines at the 300 foot level lying in shale just above the coal seams. Testing at the Smithsonian proved them to be pyrite and date 35 million years old. Sardonyx is a variant of Onyx in which the colored bands are sard (shades of red) rather than black. (shale) exteriors from the calcite centers. Because of this dividing wall (septum in Latin) the geodes are called Septarians. Druzy (also commonly spelled as Druzi, Druzes, Drusy, Druse or Drusies) is a thin layer of a tightly packed matrix of very fine crystals covering the surface of a host stone. The multitude of tiny crystals forms an encrustation of crystals that has a similar look to that of fine PaveDiamonds, but occurs naturally. There is a wide variety of minerals that can form into druzies in a variety of colors. Most often druzy encrustations are found in the center of quartz ( chalcedony, amethyst, citrine or agate) geodes but they are also found on the surface of non quartz minerals such as Chrysacola, Cobalto Pink Calcite, Uvarovite Green Garnet, Black Garnet and Rainbow Hematite or Rainbow Pyrite as well as other minerals. Some druzies such as Uvarovite Green Garnet and Pink Cobalto Calcite have naturally occurring vibrant coors. Most druzies which occur in the form of quartz have more muted colors such as white, grey, tan, brown and cream. Too create more variety in colors, quartz druzy is often dyed black or other vivid colors such as pink, purple, red, green, yellow and blue. They are also vapor coated with titanium, cobalt, gold or other metals or mixes of metals to create various iridescent finishes.